[MAUREEN DOWD NYT] John Boehner stands smiling in front of the mirror in the bathroom of his English basement apartment on G Street on Capitol Hill. He breaks into song as he fastidiously ties the four-in-hand knot in his bright green tie to get the perfect dimple. His Blackberry ring-a-ding dings. He rolls his blue eyes. It’s another panicked call from Kevin McCarthy. Boehner is beginning to wonder if the kid just doesn’t have it, if he’s bombsville. McCarthy styled himself as one of the “young guns,” along with Eric Cantor, who misfired, and Paul Ryan, who can’t pull the trigger. Now Boehner’s worried that McCarthy might be a pop gun. “Kevin, did you make another mess I gotta clean up?” the Speaker growls. “Stop blubbering. That’s my department. Obviously, you really stepped in it with that Benghazi crack on ‘Hannity.’ You told Sean that I get a B-minus as speaker? I give you a D for Dumbo. Open Link To Read The Full New York Times Article By Maureen Dowd. 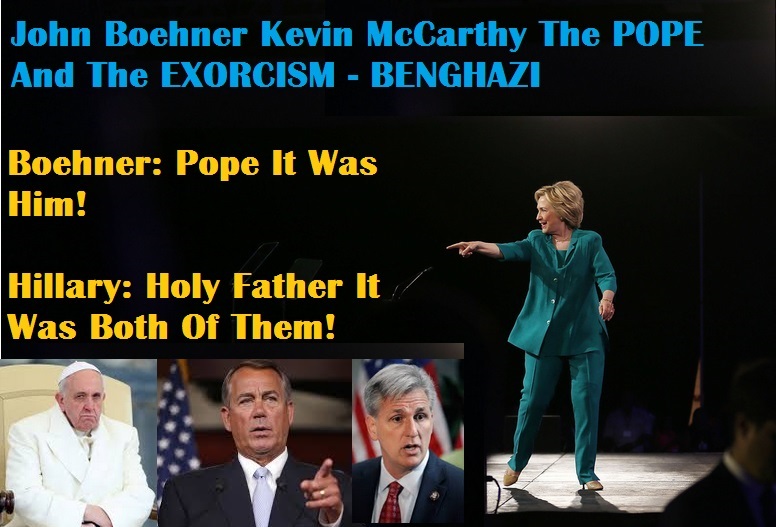 This entry was posted on October 5, 2015 at 12:27 am and is filed under Politics with tags Benghazi, Benghazi Scam, Exorcism, Hillary Clinton, John Boehner, Kevin McCarthy, Politics, Pope Francis, Presidency 2016, Republicans Liars Crooks. You can follow any responses to this entry through the RSS 2.0 feed. Both comments and pings are currently closed.